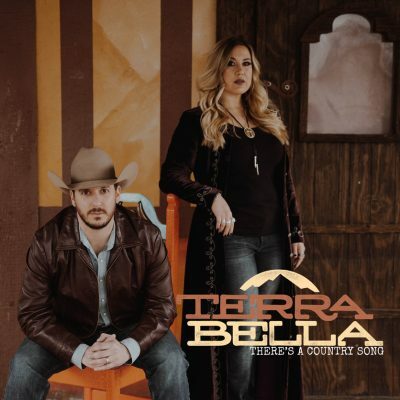 The husband-and-wife country duo, Terra Bella, has announced that their highly-anticipated new album There’s A Country Song will be released to all digital platforms on May 1st with a celebration to take place at Dawg House Saloon (1522 Demonbreun St.) in Nashville on May 2ndfrom 7-8:30 p.m. The album is currently available for pre-order including the previously released single “Before You” and “Wild One” as immediate downloads. Listed as “One To Watch” by Billboard earlier this year, the authenticity of Terra Bella’s Central California roots, communicative storytelling and beautiful harmonies are more prevalent than ever on their first full-length project. Attendees of the release party are to witness this first-hand as the pair will exclusively perform the album from start to finish alongside the studio musicians heard on the recording. The entire project was self-recorded by Terra Bella’s male counterpart, Joe Costa, from the comfort of their home studio. Costa also shares production credit with lead guitarist Johnny Garcia (Garth Brooks, Trisha Yearwood). Terra Bella plans to complete a radio tour in support of focal track “Wild One” as well as a number of regular dates across the country including Fort Campbell’s Annual 4th of July Celebration in Kentucky. Terra Bella is proudly endorsed by D’Addario, Greeley Hat Works, and Wranger. For more information on Terra Bella, please visit www.terrabellamusic.com or follow on Facebook, Instagram, Twitter, and Spotify. Find the most current Terra Bella tour dates from our partners at Country Music On Tour, your trusted country concert ticket source! Country Music News Blog participates in advertising programs that help fund the operation of this site. For more information please visit our privacy statement. This entry was posted in Featured, New Music, Press Releases, Terra Bella by Shauna "WhiskeyChick" Castorena. Bookmark the permalink.